Joe Sellman Leava, Callum Elliott-Archer, Michael Woodman and Sam Hollis Pack talk to Jess Duxbury about Worklight Theatre‘s new production How to Start a Riot. This interview takes a depth look at verbatim theatre in a show five-starred by FringeReview. 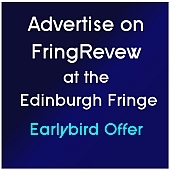 This entry was posted on Monday, August 20th, 2012 at 12:50 pm and is filed under Audio Interviews, Edinburgh Fringe 2012. You can follow any responses to this entry through the RSS 2.0 feed. Both comments and pings are currently closed.